Scientists have engineered an enzyme which can digest some of our most commonly polluting plastics, providing a potential solution to one of the world's biggest environmental problems. The discovery could result in a recycling solution for millions of tonnes of plastic bottles, made of polyethylene terephthalate, or PET, which currently persists for hundreds of years in the environment. The research was led by teams at the University of Portsmouth and the US Department of Energy's National Renewable Energy Laboratory (NREL) and is published in Proceedings of the National Academy of Sciences (PNAS). Professor John McGeehan at the University of Portsmouth and Dr Gregg Beckham at NREL solved the crystal structure of PETase—a recently discovered enzyme that digests PET— and used this 3D information to understand how it works. During this study, they inadvertently engineered an enzyme that is even better at degrading the plastic than the one that evolved in nature. 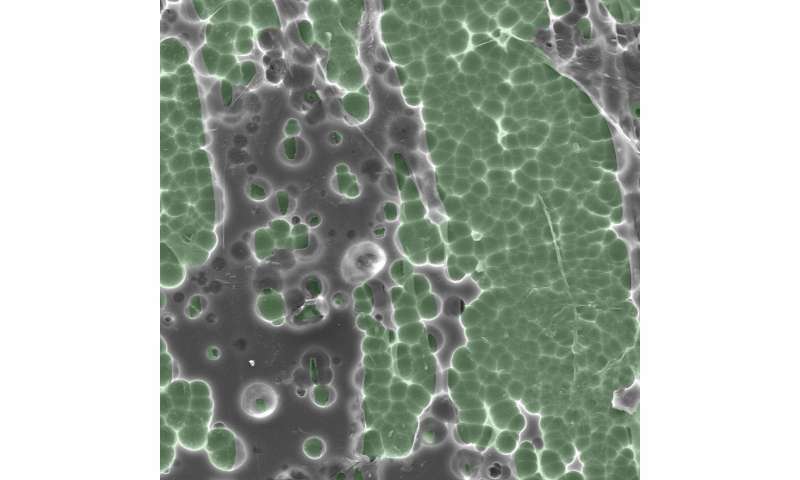 The researchers are now working on improving the enzyme further to allow it to be used industrially to break down plastics in a fraction of the time. Professor McGeehan, Director of the Institute of Biological and Biomedical Sciences in the School of Biological Sciences at Portsmouth, said: "Few could have predicted that since plastics became popular in the 1960s huge plastic waste patches would be found floating in oceans, or washed up on once pristine beaches all over the world. "We can all play a significant part in dealing with the plastic problem, but the scientific community who ultimately created these 'wonder-materials', must now use all the technology at their disposal to develop real solutions." The researchers made the breakthrough when they were examining the structure of a natural enzyme which is thought to have evolved in a waste recycling centre in Japan, allowing a bacterium to degrade plastic as a food source. The goal was to determine its structure, but they ended up going a step further and accidentally engineered an enzyme which was even better at breaking down PET plastics. "Serendipity often plays a significant role in fundamental scientific research and our discovery here is no exception," Professor McGeehan said. "Although the improvement is modest, this unanticipated discovery suggests that there is room to further improve these enzymes, moving us closer to a recycling solution for the ever-growing mountain of discarded plastics." The research team can now apply the tools of protein engineering and evolution to continue to improve it. The University of Portsmouth and NREL collaborated with scientists at the Diamond Light Source in the United Kingdom, a synchrotron that uses intense beams of X-rays 10 billion times brighter than the sun to act as a microscope powerful enough to see individual atoms. Using their latest laboratory, beamline I23, an ultra-high-resolution 3D model of the PETase enzyme was generated in exquisite detail. Professor McGeehan said: "The Diamond Light Source recently created one of the most advanced X-ray beamlines in the world and having access to this facility allowed us to see the 3D atomic structure of PETase in incredible detail. 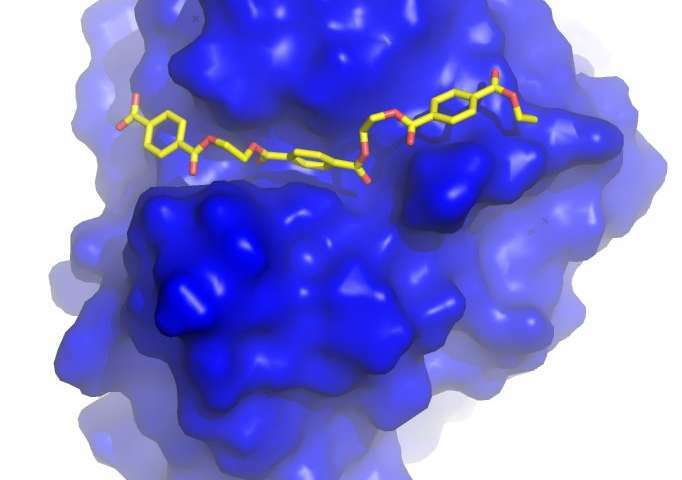 Being able to see the inner workings of this biological catalyst provided us with the blueprints to engineer a faster and more efficient enzyme." Chief Executive of the Diamond Light Source, Professor Andrew Harrison, said: "With input from five institutions in three different countries, this research is a fine example of how international collaboration can help make significant scientific breakthroughs. "The detail that the team were able to draw out from the results achieved on the I23 beamline at Diamond will be invaluable in looking to tailor the enzyme for use in large-scale industrial recycling processes. The impact of such an innovative solution to plastic waste would be global. It is fantastic that UK scientists and facilities are helping to lead the way." With help from the computational modeling scientists at the University of South Florida and the University of Campinas in Brazil, the team discovered that PETase looks very similar to a cutinase, but it has some unusual features including a more open active site, able to accommodate man-made rather than natural polymers. These differences indicated that PETase may have evolved in a PET-containing environment to enable the enzyme to degrade PET. To test that hypothesis, the researchers mutated the PETase active site to make it more like a cutinase. And that was when the unexpected happened - the researchers found that the PETase mutant was better than the natural PETase in degrading PET. Significantly, the enzyme can also degrade polyethylene furandicarboxylate, or PEF, a bio-based substitute for PET plastics that is being hailed as a replacement for glass beer bottles. Professor McGeehan said: "The engineering process is much the same as for enzymes currently being used in bio-washing detergents and in the manufacture of biofuels - the technology exists and it's well within the possibility that in the coming years we will see an industrially viable process to turn PET and potentially other substrates like PEF, PLA, and PBS, back into their original building blocks so that they can be sustainably recycled." The paper's lead author is postgraduate student jointly funded by the University of Portsmouth and NREL, Harry Austin. He said: "This research is just the beginning and there is much more to be done in this area. I am delighted to be part of an international team that is tackling one of the biggest problems facing our planet." Renewable Energy Laboratories will get Very Busy SOON ! I would be very surprised at the estimate of hundreds of years of persistence. While bacteria cannot readily breakdown current plastics very fast, they do feast on it. The biggest problem is that they eat only the ends of each tiny plastic thread, because they cannot access it any other way. But as pointed out in this article we have dumped millions of tons of bacteria food into the environment. They may eat it slow, but they do break it down. That combined with the effects of the sun and the open ocean currents, means that a lot of it is going away all the time. We are simply adding 10x to the problem for every 1x broken down. The solution is to stop allowing plastics into our bodies of water. Another is to make the plastics themselves more degradable. The idea of sucking it all up and treating it with enzyme's in huge containers is ludicrous. Today's garbage is tomorrow's resource. Do we really want to start breaking down the billions of tons of plastic we have created and converting it into even more (by weight) CO2? I think its worth considering that in its current state/form plastic represents trapped carbon that isn't going to make our atmospheric CO2 problem any worse. Degradation over centuries I don't think would be much of an issue. Degradation over decades to years and give up on CO2 limits. Put a gene in a bacterium that codes for the enzyme. Turn it loose to clean up the waste. The bug evolves. Soon it is in our homes and machines and cleaning up modern civilization. A veritable Frankansteen. Facetious to be sure, but not quite out of the realm of possibilities. Great Idea To Recycle Plastic ! Yellowstone SUPERVOLCANO about to blow? AND WHY ARE WE NOT USING FREE ENERGY of Hot Springs, Volcano Mountains etc., ONLY THOSE with Advanced Knowledge in this area should REPLY-NOT STUPIDS. I have IGNORED Comments of SO MANY from time to time !